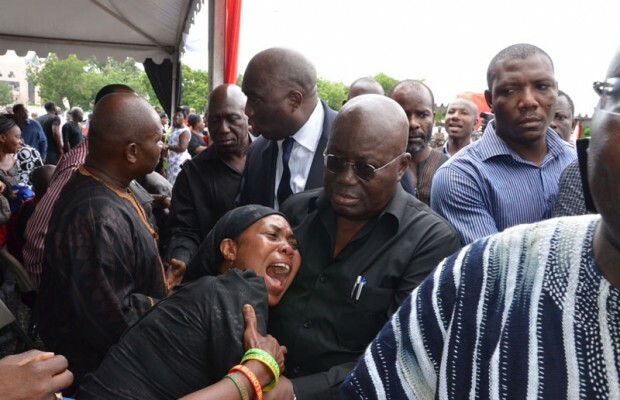 Some Ghanaians who lost their loved ones in last Wednesday’s flood and fire disaster at the Goil filling station at the Kwame Nkrumah Circle in Accra following a heavy downpour yesterday wept uncontrollably during the national memorial service held in honour of all the 152 victims. 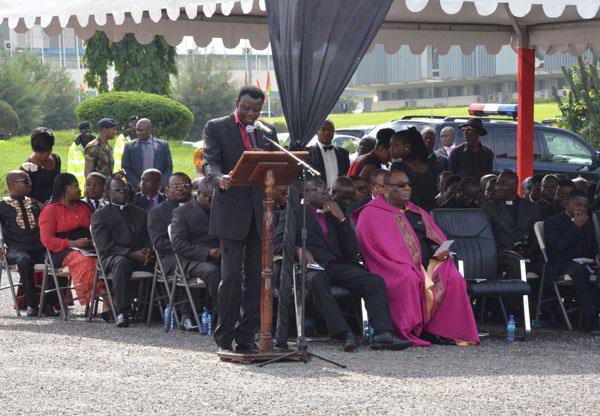 The memorial service, led by some renowned Ghanaian pastors, was held at the forecourt of the State House in Accra. In attendance were President John Mahama; former Presidents Jerry John Rawlings and John Agyekum Kufuor; flagbearer of the New Patriotic Party (NPP), Nana Addo Dankwa Akufo-Addo and his running mate, Dr Mahamudu Bawumia, gurus of all the political parties as well as people from all walks of life. The twin fire and flood disaster left several people who were seeking shelter as a result of the heavy downpour burnt beyond recognition. In a solemn address, President Mahama asked Ghanaians to put what happened last Wednesday behind them and focus on the future and how the problem of the perennial flooding in some parts of the city during the rainy season could be solved. “This is not time for finger pointing and apportioning of blame for negligence,” the President pointed out and stressed that Ghanaians must rather dispassionately assess the problem of perennial flooding in the city and suggest what government must do to solve the problem permanently, claiming that his government was ready to do that. He however said the government was prepared to use DNA to identify all those who were burnt beyond recognition for them to be remembered eternally. “These are 152 human lives—152 mothers, fathers, brothers, sisters, children and Ghanaian citizens. With each number, there is a face; there is a story. With each number there are dreams, hopes and achievements that have died,” he said. The President said government had directed the release of funds to repair roads and support survivors and displaced persons – reported to be about 8,000. Reverend Eastwood Anaba, founder of Fountain Gate Chapel, said as Ghana mourns the dead, the country should involve the expertise of every individual in dealing with the challenges. According to him, though the country was in a state of mourning, weeping would not solve the problems. Rev Anaba stated that the nation needed to make sacrifices and act positively to help handle the situation. “Ghana is in a state of mourning but weeping does not solve problems. Positive action involves expertise. Positive action is a virtuous action, which ultimately results in positive happiness. Our engineers, doctors, contractors, businessmen and even the ordinary person in the citizenry must be able to have the necessary expertise to deal with challenges like this. We are a nation of prayer; let us add positive action to the prayer. For those that pray, let them provide the material things,” he said. He urged President Mahama to tap into the tanks and reservoirs of wisdom from his predecessors to help prevent such disasters from recurring. “There are reservoirs and tanks of wisdom we can fall on in times like this.We have two ex-presidents who are monumental figures I have strongly admired over the years, and they are reservoirs of wisdom we can fall on. We must continue to improve on every aspect of our society so that things like this don’t happen again in our society,”Rev Anaba said. He disclosed that the nation needed to operate outside her comfort zone to be able to help the flood victims and the victims of the fire outbreak. “If we want to operate within our comfort zone, there is no way we can help the flood victims and the victims of the fire outbreak. Every one of us will have to make some sacrifices,” he urged. The event brought together a host of religious leaders like Bishop Dag Heward-Mills, Bishop Christie Doe Tetteh and Archbishop Nicolas Duncan Williams among others, who took turns to pray for the victims of the disaster, their relatives and for the country as well. The Christian Council of Ghana also held a similar service at the Ebenezer Presby Church, Osu, last night. When DAILY GUIDE caught up with some relatives of victims of the flood and fire tragedy, a lady who only gave her name as Maame Ama recounted that she lost her sister, Vida Sackey, who left behind three kids. “My sister, Vida Sackey, was on her way home on that fateful day when she received a call that her provision shop was flooded. She died on her way back to her shop. When we got to the 37 Military Hospital mortuary, she was the second body seen. She left behind three kids. The eldest is about18 years, the second is writing the BECE on Monday and the last born is 13 years,” she said as she wept uncontrollably. An elderly man, Sir Louis Kwao, said he lost his 43-year-old daughter, Millicent Daade Tagoe, in the flood that hit the Pedestrian Mall near Odawna at the Nkrumah Circle. “She sells lingerie at the Pedestrian Mall. When the rain started and the place started getting flooded she was with her three kids so she called for help and a Samaritan came to carry her kids to safety. Before the Samaritan got back, the flood had taken my daughter away. I was at home on Thursday – the day after the flood – when one of my daughters came to inform us that she had received a call that my daughter died in the flood. They found her body under a container at the Pedestrian Mall. We rushed to the 37 Military Hospital and after going through the bodies at the mortuary, I found the lifeless body of my daughter lying there,” he sorrowfully narrated.